Imagine Dragons fans, we’ve got news for you! 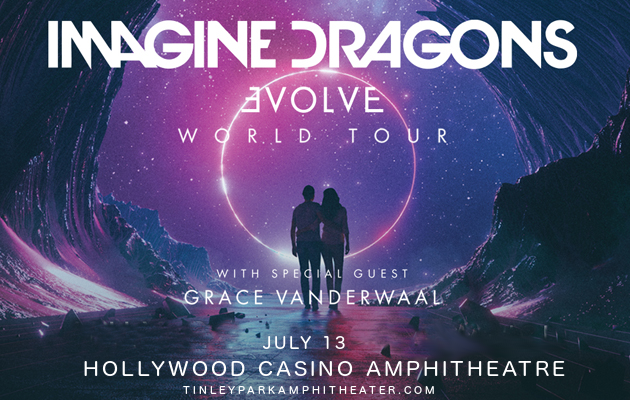 Your favorite band are back on tour with their latest album “Evolve,” featuring support from the incredible singer-songwriter Grace Vanderwaal!! They’re coming to Tinley Park, Illionois on Friday 13th July 2018. Catch them at the Hollywood Casino Ampitheatre – hit the “Buy Tickets,” button now!! Get ready to hear all the brand new material from “Evolve,” along with the classic songs you know and love, and maybe some unexpected surprises too! Get your Imagine Dragons tickets TODAY while stocks last! !